Just completed filming on an action fight sequence, and for the first time made use of the DJI Osmo Mobile, which is a 3 axis gimbal stableliser. Filming hand-held and getting a smooth shot is never easy and it seems to me that the process and kit is getting both more complex and heavier. I’ve filmed using the MoVi fitted with a Canon C300 MKI. While it’s a very impressive bit of kit particularly with the remote controller, it was heavy in use, too heavy for extended use and I would suspect that in long term use it is going to put pressure on your back. So while I love this piece of kit I’ve been looking around for something lighter and to be honest much cheaper to buy. Enter the DJI Osmo Mobile, it ticks all the boxes, it’s lightweight and uses the camera you already have in your pocket, your smart phone. Mine is the iPhone 6 and in preparation for the shoot I purchased the Filmic Pro App. The Filmic Pro App, which allows you full manual control of the camera settings on the iPhone and most importantly supports the DJI Osmo Mobile. 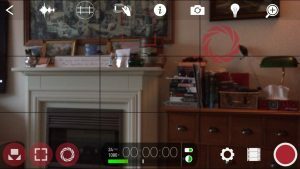 Personally I found this App relatively intuitive to use, but I checked out the online manual to find out the how to use some of the more advanced features like rack focusing. I had a few issues with the App during filming but I’ll go into that in another post but lets just say I nearly ditched using it during the project and just going with the DJI Go App which comes with the Osmo. The plan was to use the DJi Osmo mobile for the close up shots and for scenes where we planned to follow the action. First impressions were good, the movement was stable and smooth and the footage would not need any stabilisation in post production. This was promising and the quality of the footage from the iPhone was great, Filmic Pro lets you set the resolution up to 3K and to 50 Mbps, so my settings were HD 1080p and 50 Mbps. The link to the DJI Osmo mobile was a bit iffy and I needed to reset a few times but in use the setup is light, highly manoeuvrable and perfect for getting close to the action and places with limited access. Walking across an uneven surface didn’t faze this device and saved hours that would have been spent setting up track and dolly to get the same shots. I’d not want to film a feature using this setup but for a short film this setup is perfect and I suspect with additional add ons like lenses with different focal lengths using the 35mm adapter/Image Flip and Anamorphic lenses like the Moondog Anamorphic 2.40:1 adapter you could have the perfect setup for a micro budget film.